"He was murdered, wasn't he?" When Cora Lansquenet is savagely murdered, the extraordinary remark she had made the previous day at her brother Richard's funeral suddenly takes on a chilling significance. At the reading of Richard's will, Cora was clearly heard to say, "It's been hushed up very nicely, hasn't it. But he was murdered, wasn't he?" Did Cora's accusation a dark truth that sealed her own fate? Or are the siblings' deaths just tragic coincidences? 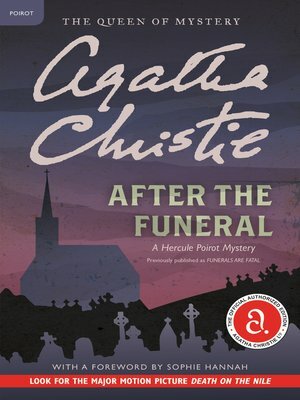 Desperate to know the truth, the Lansquenet's solicitor turns to Hercule Poirot to unravel the mystery. For even after the funeral, death isn't finished yet . . .